That’s right, Tangaroa Terrace Tropical Bar & Grill has officially reopened at the Disneyland Hotel at the Disneyland Resort! 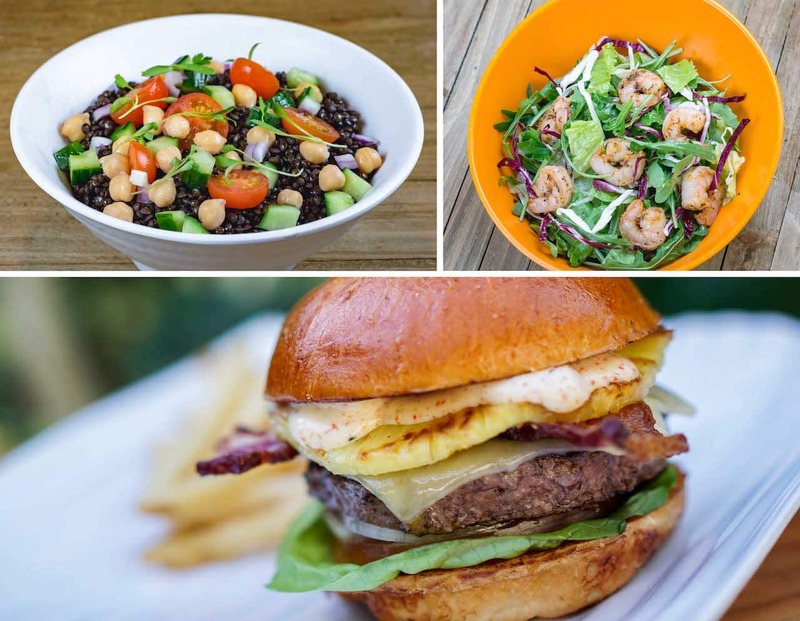 After an exciting refurbishment, the fast-casual restaurant has a vibrant new look, expanded offerings and is back and serving up made-to-order dishes, signature tiki cocktails, Dole Whip and more! Tangaroa Terrace, inspired by Walt Disney’s Enchanted Tiki Room, is the perfect tropical complement to the mid-century modern architecture of the Disneyland Hotel. This island paradise combines traditional motifs from many Pacific islands such as Hawaii, Tahiti, Fiji, Sumatra and New Guinea. Inside, new décor details feature a colorful tropical mural with “hidden” tiki room birds (can you find them all? ), bamboo accents, exotic stone countertops and glass fish net float lights, with open air views of the pool. Outdoors, guests enjoy an expanded new patio with brightly colored rattan lounge chairs, tiki bar stools and a communal table for fun, inviting ways to enjoy sunshine and the island vibes. Throughout the day, guests can snack on freshly prepared hot and cold dishes all day long. For breakfast (served until 11am), chow down on a classic Breakfast Platter with scrambled eggs, bacon, and hash browns or bite into a Breakfast Sandwich with kālua-style pulled pork, fried egg, hash browns, and gravy. 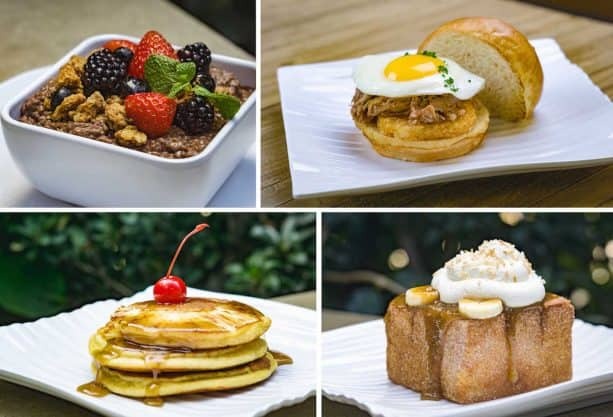 Sweet options include the Açai Chia Breakfast Bowl with seasonal fruit and granola and Pineapple Upside Down Pancakes. One of my FAVORITE breakfast dishes of all time can also be found here – Tangaroa Toast! This brick toast comes coated in cinnamon sugar, and topped with bananas Foster, whipped cream, bananas, and toasted coconut. If your mouth is watering from the breakfast menu, just wait until you feast your eyes (and taste buds) on the lunch and dinner menu! 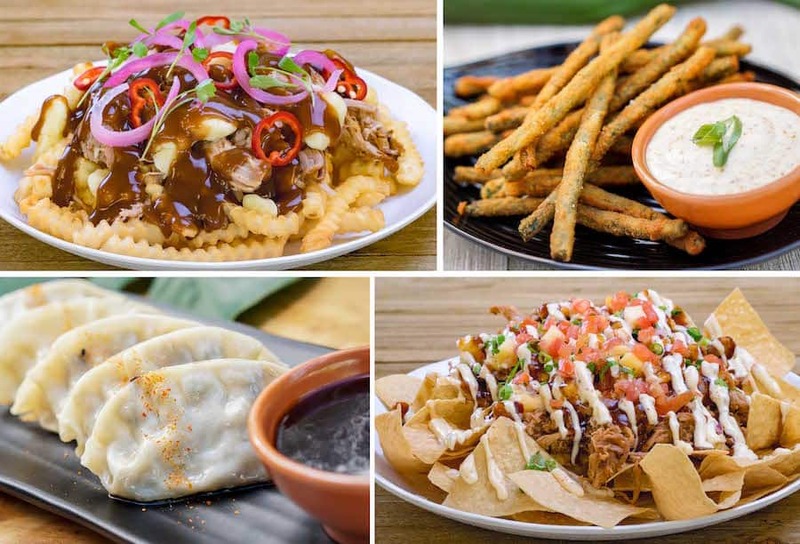 Sharable options include dishes such as the Kālua-style Poutine (crispy crinkle fries topped with pork, cheese curds, gravy, pickled onions, and Fresno chiles – YUM) and the Pu Pu Platter, which is another one of my favorites! The platter comes with Chili-Garlic Edamame, Pork Gyoza (pork and vegetable pot stickers), Sweet-and-Spicy Chicken Wings, and Panko-crusted Long Beans served with togarashi aïoli; all four can also be ordered individually. And if nachos are more your style, you can snack on the Shipwreck Nachos topped with kālua-style pulled pork, pineapple salsa, hoisin sauce, togarashi aïoli, and barbecue sauce. And of course, you can’t go wrong with the Chili-Garlic Edamame (it’s included in the Pu Pu Platter, but you know you’re going to want more!) – young soybeans steamed and tossed with chili-garlic sauce – or even the Fried Spam Musubi served with teriyaki sauce! Other dishes include a Lentil Garden Bowl with brown rice, cucumbers, cherry tomatoes, and onions tossed in coconut curry; the Tangaroa Salad with sautéed shrimp; and an Angus 1/3 lb. Hawaiian Cheeseburger served with grilled pineapple, Applewood-smoked bacon, Havarti cheese, togarashi aïoli, and teriyaki sauce. Kids can enjoy their own smaller-portioned versions of these tropical bites. 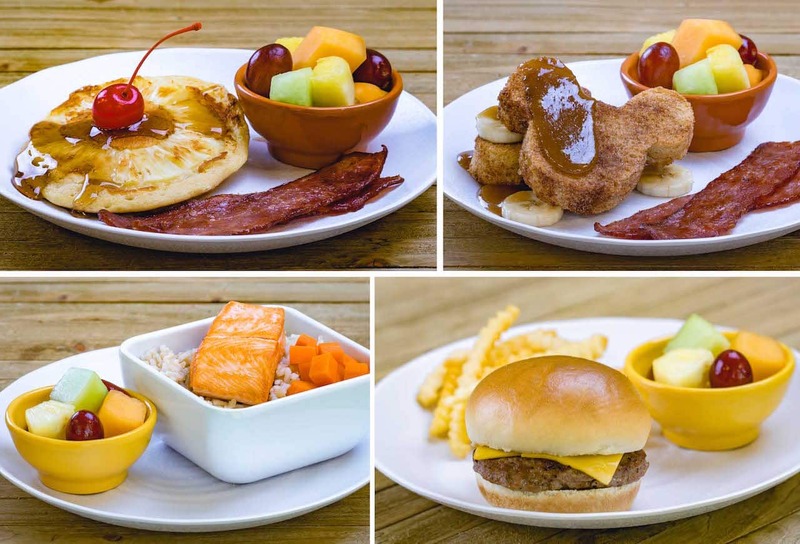 For breakfast, the Kid’s Breakfast Platter and the Kid’s Pineapple Upside-Down Pancake are great options. They can even get the Kid’s Mickey-shaped Tangaroa Toast! All three dishes are served with turkey bacon and fresh fruit. For lunch and dinner, the kiddos can munch on a yummy Grilled Salmon Bowl, a Kid’s Cheeseburger, and the ever-so-popular and tasty Chicken Breast Nuggets. 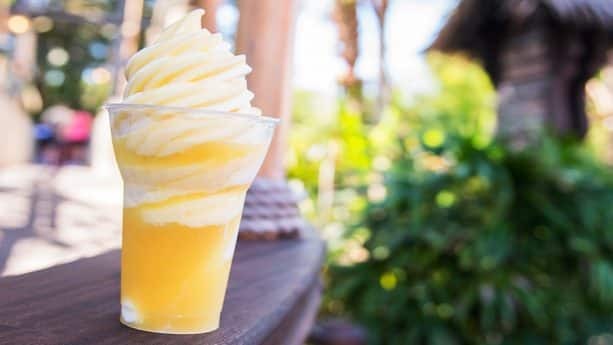 The restaurant also offers a newly-enhanced marketplace for grab-and-go pastries and snacks, specialty coffees, pineapple Dole Whip soft serve, Dole Whip floats and Dole Whip floats with a splash of rum, plus a full bar of island cocktails. Mobile ordering is available at this location as well, so if you’re on-the-go, you can enjoy the convenience of ordering and paying for your meal via the Disneyland Resort app without having to wait in line! How cool is that? 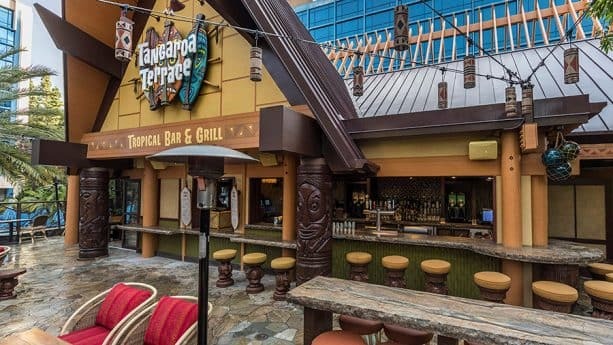 Tangaroa Terrace Tropical Bar & Grill is located in the Disneyland Hotel adjacent to Trader Sam’s Enchanted Tiki Bar and the pool area! For more information as well as the full menu, visit the Disneyland Resort website, or come on out and experience it for yourself! Previous articleCelebrate ‘The Lion King’ This Summer at Disney California Adventure Park!